This weekend, I was able to get in a 4 and a 5.5 mile run in. Both felt good and the times were about what I want for my marathon pace 10:45. I am still taking it slow for recovery, however on Friday I got my new shoes and heel lifts, which was a world of difference. I went into Road Runner Sports and returned the trail shoes without any problem and got a pair of Asics Evolution 3. I was in and out of the store in about 5 minutes. 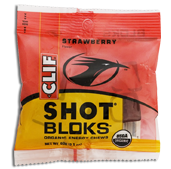 When I was checking out I saw Cliff Shot Block Strawberry. I picked up a couple of bags, since I never tried them before. Some of you have mentioned them before and I figured what the heck, I will pick up a couple of bags of them and give them a try, since I am not a big fan of gels. Even though my difference is down for recovering from injury, I tried them on my run on Sunday and I loved them, they are awesome. I did not even get my hands sticky. I started comparing them with gels and here is what I found. The numbers are pretty comparative, except for the sodium which is ok with me, since being in AZ during the summer you need the sodium. I did see that they have a cola, lemon lime, and Pina Colada flavor. I wonder if the Pina Colada has anything to do with their winery. Wrong alcohol, oh well, I will have to find a location that carries them in those flavors. Saturday I ended up back at Road Runner Sports and ran into Pokey and company. You know you are becoming a runner when you know people at the running store. I got the little boy a pair of running shoes and grandma picked up a pair of walking shoes. We also went by the park where the Ragnar Del Sol race will end this weekend. How can you go by a park and not let the kids play on the equipment and feed the ducks. I try to be a good dad. We then went to Bass Pro Shop. The boys have never been there, and they were in heaven. 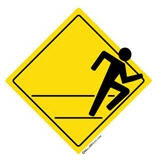 I will do a couple of easy runs this week, in preparation for the race on Friday. We start at 10 am and will finish around 1:30pm on Saturday. I will take some pictures of the crew as we run for the Chances for Children Charity.